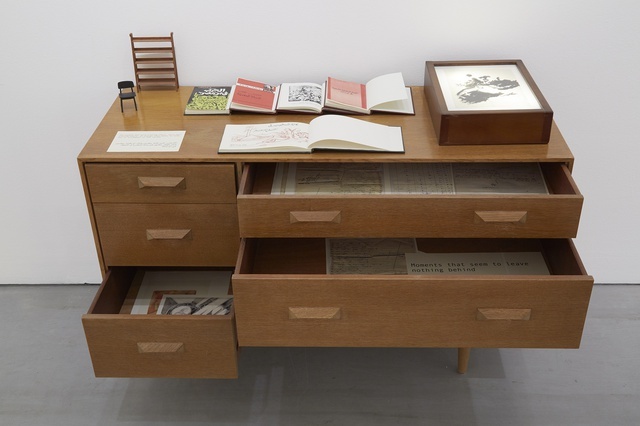 The two current and contiguous exhibitions at Carroll/Fletcher Gallery, London seem, at first sight to have little in common. Nevertheless, it may be an art writer’s role to draw out underlying concepts and consistencies perceived within apparently heterogeneous offerings. In the ground floor galleries Richard T. Walker shows ‘Everything Failing To Become Something‘ involving more (he exhibited here about a year ago) of his carefully rendered research into the contemporary possibilities of lingering shards of a possible Romanticism. Downstairs, the basement space is occupied by Basel Abbas and Rouanne Abou-Rahme’s ‘Unforgiving Years: The Incidental Insurgents‘. 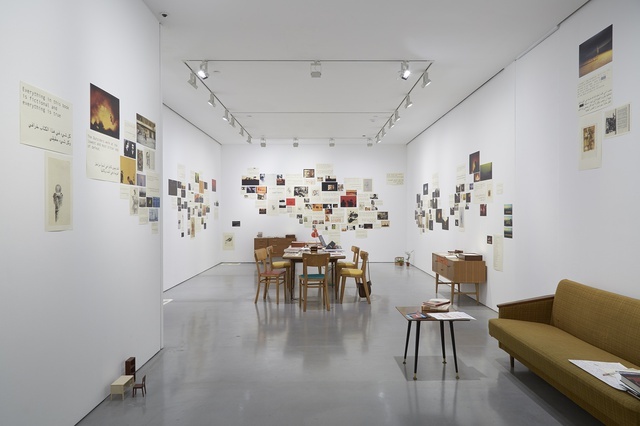 This is a meticulously arranged group of texts and images that fill walls and pile up on a large central table, accompanied by a nearby sofa, small house plants and several chairs. Scanning the plethora of language on view (most of it translated as both Arabic and English) you repeatedly gain the sense of still-born, defeated or abandoned revolutions and revolutionaries, perhaps giving voice to a situation that requires poetics and a philosophical stance to compensate for a failed or inadequate politics. 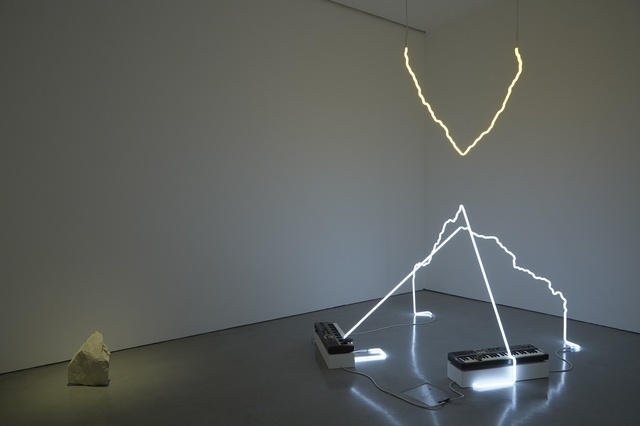 Upstairs, Walker has installed a two-channel video, projected as a large image on the wall, as well as several ‘sculptural’ pieces involving tripods, electric guitars, keyboards and some artfully shaped neon tubing. Among several other crisp interplays of current and recent technology there are also large, framed blow-ups showing details from 19th c. woodcuts depicting famous mountains. Walker has intervened here to cut out the mountain peaks as roughly circular pieces of paper then allowed these to drop casually down inside the frame. Both these prints and the shaped neon refer to the similarity between mighty mountains, their aspirational peaks, and the smallest of mere rocks and stones. By blurring this distinction the artist seems to suggests that it is only human perception and the imposition of human sense of scale onto nature that creates a hierarchical distinction between them. Asked by the artist to compare a hand-held rock with a distant mountain or its decapitated peak you are quickly drawn into fractal, and therefore relativist thoughts. Walker himself appears in his video as a slightly slacker-esque, everyday, white-middle-class artist/guy who has parachuted himself (though you actually suspect he uses an SUV) into what appears to be an American wilderness. 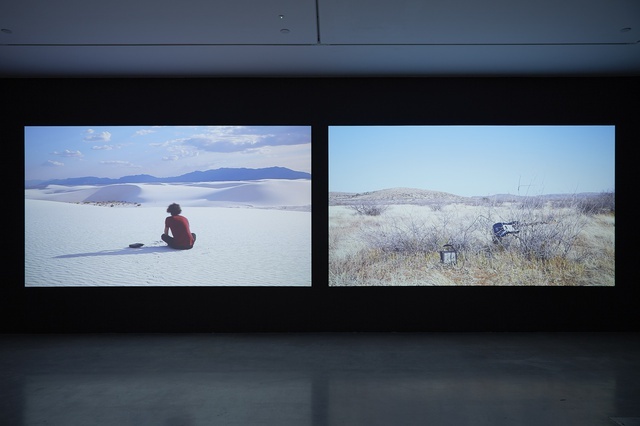 You see him, back turned to the viewer in classic Romanticist mode, gazing into a desert or towards distant mountains before sitting and musing existentially into a retro portable cassette recorder (one of several references to a history of technologies in his show.) Walker talks spontaneously and intelligently about the possibilities of locating meaning and form in a natural world that seems all too ready to reject even those humans who so revere and wish to belong to it. Eventually he flings his recorder, and his language with it, as far as he possibly can (which is not far) into the landscape. It’s an oxymoronic act of defiant resignation. Even stream-of-consciousness style introspection seems to have failed this artist. And yet, this very act seems to mark a turning point in the narrative which soon moves from a bluesy mood of quiet desperation into optimism. The act of ‘flinging’ suggests a peculiar means by which to glean music, and thus form and value, from the artist’s contemporary encounter with the sublime. 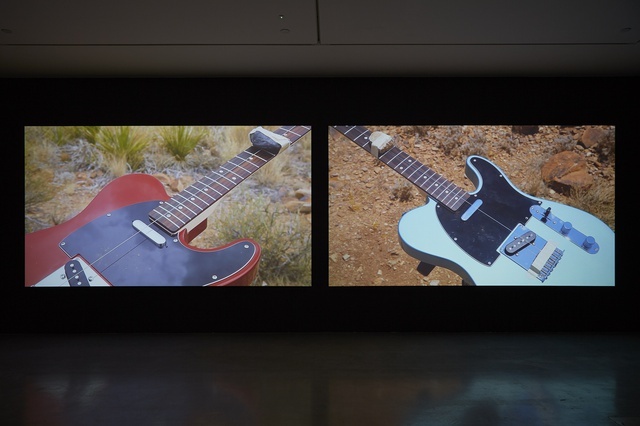 Walker goes on to repeat the same ‘flinging’ gesture, but now using rocks to aim at carefully placed and prepared musical instruments set within the landscape. He thus produces, through a mix of contrivance, chance, (and surely some careful video editing too), a sublime, droning soundtrack that sings a response to the infinite spaces and mysteries of nature. Scrutinisng the rest of Walker’s show in the light of this video you then realize that the tripod-mounted guitars are those that appear (along with drums, cymbals, children’s xylophones etc.) in the film. Their resilient painted surfaces betray scars and chips caused by stones that missed the string at which they were aimed. thus the show starts to cohere in a witty but no less sincere search for a contemporary sense of profundity. 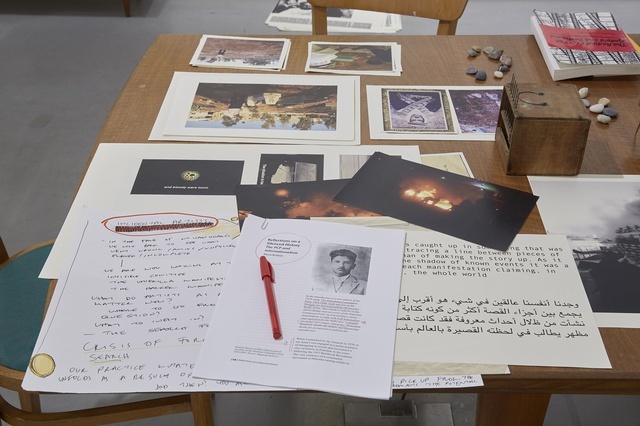 Downstairs Basel Abbas and Rouanne Abou-Rahme’s table is piled with books that we might read, as well as photocopies with phrases highlighted or otherwise marked for attention. Most of the photographs -pinned to the wall in a careful composition with the texts- show either silhouettes or backs of people, invariably occupying scenes dominated by shadow or fading to black at their edges. The source of the numerous quotes is not immediately apparent but the carefully written press releases informs you they derive from anarchist Victor Serge and “… the Parisian Bonnot Gang: Abu Jildeh, Arameet and their companions fighting the British in 1930s Palestine …” as well as a character in a Roberto Bolaño novel, and the artists themselves. What really catches your eye, sparks your imagination and perhaps touches your heart is the inclusion of some miniature desks, chairs, chests of draws, a tiny sofa and other furnishings, and both here and in those numerous evocations of failure, resignation and pictures of back-turned figures you begin – against the odds – to draw out a line of thought that might connect with Walker’s show upstairs. The drone of Walker’s atmospheric music drifts down the gallery stairs forming a subliminal halo gracing to the experience of the show in the basement space. Meanwhile, the miniature furnishings disrupt your perception of scale and once again raise questions for you of man’s place within the great (and small) scheme of things. You recall that Edmund Burke’s influential 18th century treatise on the sublime did not only refer to enormous objects and events, such as mountains and storms, but also considered tiny things, such as mice and spiders, as equally capable of invoking sublime feelings. In fact it can be anything that, in being either too large or too small for us to predict, to fully comprehend or to exert our wills and control over produces sublime sensations. Now, the statements on the wall (which sometimes reminded you of the resounding depths of Maurice Blanchot) take on a new value and meaning for you. They seem -not unlike Walker’s own discarded words – to mark a certain limit at which politics collapses or abandons us and thereby ushers in a return of either militarism, religion, or a fusion of the two to fill the resulting political void. Now it is not so difficult to transfer your reading of one show onto another. Ultimately, it would be incongruous or crass to compare the youthful aesthetic and existential crises of Walker, a lone, middle-class, young artist with the immanent crisis facing e.g. many Palestinians or Syrians today, but both shows portray, in their own ways, a particular point at which a hoped-for redemption is denied, nevertheless forcing the ever-resourceful human mind on to discover and express new forms, new language, new recognitions, new acts and new states. There is, inevitably a kind of beauty in meticulously ordering and presenting any form of research, even if it is research into something as bleak as failed revolutions and revolutionaries, even if your research is throwing rocks into the landscape. Like the music gleaned by Walker upstairs from a point just beyond resignation, using an aleatory method discovered only after throwing into the void his last attempt at speaking, it is at least reassuring to be reminded by all the artists currently showing at Carroll/Fletcher that we are almost always capable of finding or creating some form at least, even if and when we may have relinquished a search for meaning. Posted on October 9, 2015 October 15, 2015 by pbpokane	Bookmark the permalink.